Cover art by Steve Ditko. First appearance of the Sandman in Nothing Can Stop The Sandman! Script by Stan Lee, art by Steve Ditko; The Sandman tries to hide from police in the high school where Peter Parker goes to school. Intro Betty Brant and Liz Allen. Reprinted in Marvel Tales # 141. 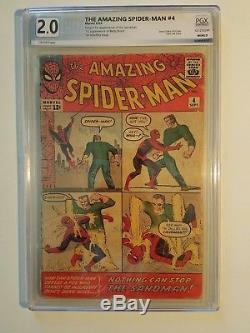 The item "1963 Amazing Spider-Man 4 2.0 PGX 1st Sandman Not CGC/CBCS" is in sale since Sunday, April 01, 2018. This item is in the category "Collectibles\Comics\Silver Age (1956-69)\Superhero\Spider-Man". The seller is "thundertitan117" and is located in Elon, North Carolina. This item can be shipped to United States, Canada, United Kingdom, Denmark, Romania, Slovakia, Bulgaria, Czech republic, Finland, Hungary, Latvia, Lithuania, Malta, Estonia, Australia, Greece, Portugal, Cyprus, Slovenia, Japan, China, Sweden, South Korea, Indonesia, Taiwan, South africa, Thailand, Belgium, France, Hong Kong, Ireland, Netherlands, Poland, Spain, Italy, Germany, Austria, Russian federation, Israel, Mexico, New Zealand, Singapore, Switzerland, Norway, Saudi arabia, Ukraine, United arab emirates, Qatar, Kuwait, Bahrain, Croatia, Malaysia, Brazil, Chile, Colombia, Costa rica, Panama, Trinidad and tobago, Guatemala, El salvador, Honduras, Jamaica.